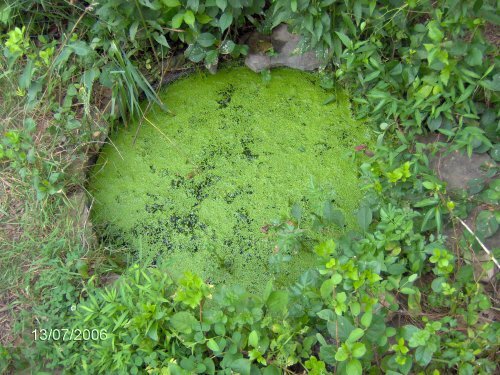 In this photo, taken 7/13/06, my 50 gallon tub pond is covered in duckweed. This pond contains amphibians, snails, and pond plants. This pond has seen better days. Initially set up as a pond for lotus, the deer and raccoons have destroyed repeated attempts at growing lotus in the pond. These days, the pond mostly serves as another place for my green frogs to lay their eggs. In the photo above, the pond is covered in duckweed. Under that is hornwort and tadpoles. This year (2006), I have put in half a dozen lotus tubers, and the deer and raccoons ate and/or pulled them all up.